This may sound like a philosophical post, but it’s not. Nevertheless, I really do feel that the effect biomagnification has on humans is very much like karma (coming back bigger and greater than ever before). Don’t get it? Read on! Before we get into biomagnification, it is important to brush up on our food chain basics. I’ve written about this in Earth’s Paradox: Greater complexity, more stability (if you want to check it out), but here’s a refresh. The food chain is a representation of who eats whom. It starts with plants fixing sunlight into complex organic substances (food), which gets consumed by herbivores, then carnivores and then bigger carnivores. The same occurs in aquatic ecosystems, but the players are different; phytoplanktons fix the sunlight and are first consumed by zooplanktons, then fishes and then bigger fishes. 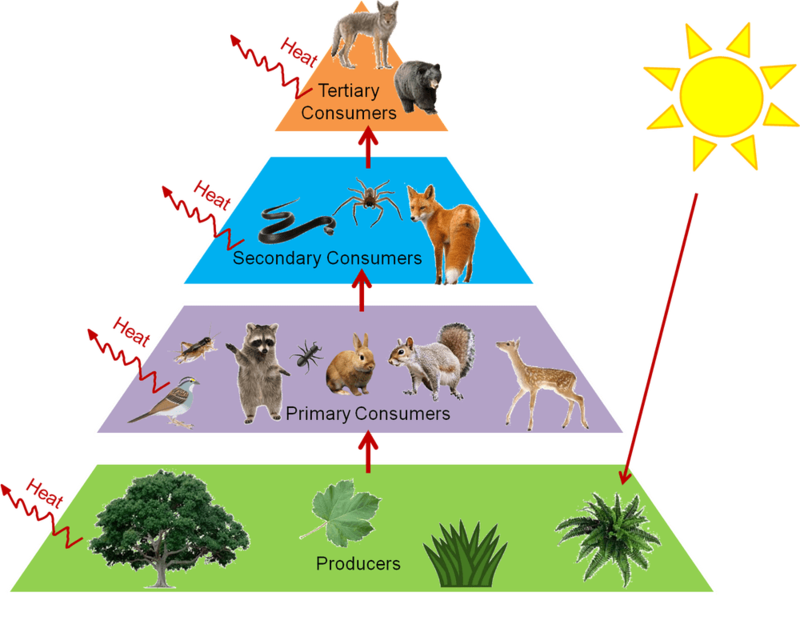 The primary purpose of the food chain is to transfer energy from one organism to another. However, nature is complex; therefore, there isn’t just one producer or consumer. All organisms that occupy the same place in the food chain are grouped into a trophic level. In ecology, when we talk about transfer of energy, we talk in terms of it’s transfer through each trophic level. In this pyramid, all the organisms in one level perform the same role in their food chains. Therefore, they are grouped into the same trophic level. It is extremely important to remember one thing: when an organism eats it’s prey, it only gets a fraction of the energy that the prey has. This is why a we go up the pyramid, the number of organisms decrease. There isn’t enough energy to sustain too many lives. Most of the energy is lost through metabolism or through heat. The energy that is transferred to the next level is actually that is left over after the organism meets all it’s energy needs. Likewise, in this eating process, other things that are left over can also get transferred into the next trophic level. One of things are pollutants. Today, most agricultural production takes place with the help of chemicals. These chemicals are inorganic substances added into the organism’s metabolism as nutrients, to increase it’s production. However, every organism has a limit up to which it can utilize nutrients. Anything extra….just stays there. It gets left over. As these chemicals get accumulated in the organism (in this case the plant), it becomes part of the parts that are generally eaten by the next level or organisms. I mentioned that the energy transferred to the next level is always a fraction of what is available in the previous level. This is because the organisms of the previous level uses energy it has. However, extra nutrients (or chemicals) are of no use to the organisms there. Therefore, all of it is transferred to the next level with a fraction of the previous available energy. In total, we now have less energy and a greater proportion of chemicals in the next level. This process of increase in concentration of chemicals or any toxic substance from one trophic level to the next is called biomagnification. it should be long lived, not easily broken down by metabolic processes. it should be fat-soluble and not water-soluble (since most of what is eaten by the next trophic level is the fatty meat). it should be an active constituent of biological growth (in small amounts). DDT is a chemical often used in agricultural practices. It is a common pesticide. But when excess of it is used by farmers, the unused DDT flows into water bodies with irrigation water. Here, it enters the food chain. It gets taken up by zooplankton as they eat phytoplanktons. Fishes get DDT into their bodies when they feed on zooplankton, and obviously, the chemical is biomagnified. Fishes get eaten by larger fish, which then get eaten by birds. Birds get the brunt of the chemicals; almost 345 times the initial amount taken up by the zooplankton! It massively affects the bird’s ability to make shells for their eggs. Studies regarding effect of DDT in Long Island showed that the shells thinned considerable due to biomagnification. It’s karma because it’s not just birds that are affected. DDT is but one example of a biomagnified chemical. So many chemicals are used in agriculture, and many of them are waste products from industries that run into the ocean. From these sources, they enter the food chain. The pesticides used to protect crops remain as residues and enter into our bodies magnified. The industrial wastes polluting the ocean enter into the fish-food chains, and fishes are a staple diet in many parts of the world. In other parts, it is a delicacy. Here’s how it gets us. Literally. What we do to the environment eventually comes back to us through our food, and it is in much higher concentrations. I doubt if anyone has ever explained “karma” this well ever!! Haha, I understand sir!! It was a nice post. I appreciate the fact that you keep your language so simple! Haha I understand sir, and I really appreciate the fact that you keep your language so simple. Once read and concept clear! Nice post! Great article! Many of the pesticides can bind to hormone nuclear receptors in the animals’ and humans’ organisms and cause all kinds of disruptions. Absolutely. Most people don’t even know that their food is slowly killing them.